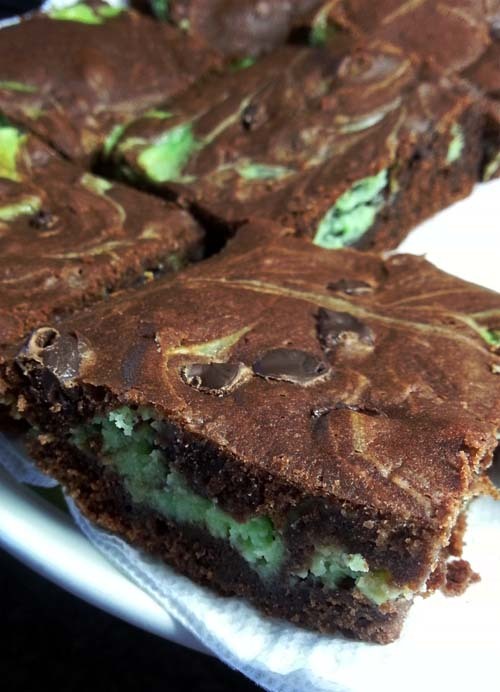 I think that these delicious brownies are fantastic for holiday parties. Somehow, the taste of mint makes everything "Christmassy", if that's even a word. The recipe is from a YouTube video that I found. It's not long and easy to follow. So check it out. In a medium sauce pan, melt butter and semi-sweet chocolate over stove. Mix until well blended then remove from heat and let cool to room temperature. In a mixing bowl, pour melted chocolate butter sauce and combine with sugar and stir. The sauce should somewhat solidify. Add eggs and continue to mix until well-combined. Then add vanilla extract, flour and salt. Mix well and fold into itself. Result should be fudgy. Set aside. In a large mixing bowl, combine cream cheese, sugar, egg yolk, peppermint extract and green food coloring. Mix together until smooth. Best to use a hand mixer. Add chocolate chips and fold them in. Do not use the hand mixer for this. Use a spatula. Prepare a baking pan with parchment paper. Spray Canola oil or non-stick spray. Add bottom layer by scooping 1 cup of the chocolate fudge and flattening it as best you can over the bottom of pan. Use a spatula to even out the surface. Next, add the cheesecake layer on top of the bottom layer. Smooth it out the best you can with spatula. Add the leftover chocolate fudge on top of the cheesecake layer. Make swirls to your delight. Remove from oven. Let cool to room temperatures. Cool in refrigerator for another 30 minutes or more before serving. This is the video used for reference. Check it out!